Hire one of our VW Campervans to explore County Durham, Northumberland, Cumbria, Yorkshire and the North East of England. At Sweet Campers we are in the perfect place to start your journey as we are nestled in between North Yorkshire and Northumberland, Cleveland and Cumbria. With the freedom to explore, go where you want, when you want! Our campers are fully equipped and include fully comp insurance, unlimited mileage, free parking for your car, free train station pickup and drop off. All you’ll need to bring is yourselves and a sense of adventure. 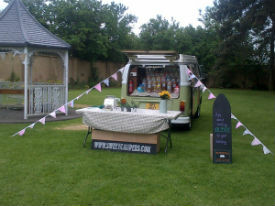 We also cater for weddings and special events. Olive, originally from USA is a 1979 left hand drive VW Westfalia Berlin Deluxe. She has an immaculate two tone White over Beryl Green colour, carefully refurbished her in and out and a real beauty to drive. She has a two litre engine to get you up the hills and excellent servo disk brakes to get you down again safely. She is the easiest Vw we have ever driven. 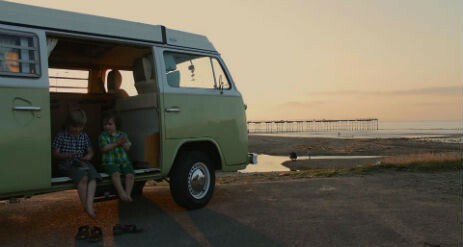 Olive is an awesome camper and great for making those special family memories. 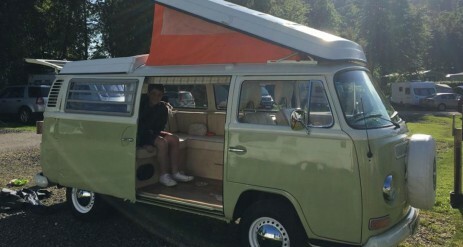 She is also packed with everything you need for a short break including Westfalia pop top, which sleeps two children, double ‘rock and roll’ bed to sleep two adults, original Westfalia camping cabinets, sink, cooker, fridge and even a small wardrobe to hang your clothes. An optional awning is available for more sleeping and living space when you are on site. Florence is mainly our wedding campervan. She has been specially designed with Weddings and Proms in mind, however if you are lucky you may be able to grab a short break in her as she is a great camper too. She has a large spacious L shaped cream and beige leather bench seat, which can easily fit 5 to 6 people (depending upon size of dresses, etc) and finished to the highest standard. Florence just looks beautiful in wedding pictures. A 1972 Westfalia crossover brought in from the USA she has been refurbished to the highest standard. 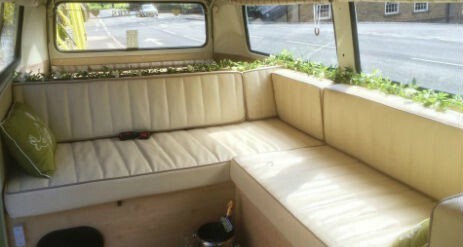 The comfy bench seat easily pulls out to provide a large double bed. Cooking facilities are discretely concealed at the back and there is plenty of storage space. She has an 1.8 litre engine and servo disk brakes and is a great pleasure to drive. We have a passion for old vw campervans and a love of sweets, so we have combined the two to bring you a taste tingling retro Sweet Shop on wheels as well as Wedding Transport. We are certain that we will bring something exciting and refreshing to your event, whether it be a Wedding, Festival, Corporate Event or even just a Party. We are able to provide you with a chauffeur driven service for Weddings. Our vintage camper is the perfect fun and stylish way to get you to your day. 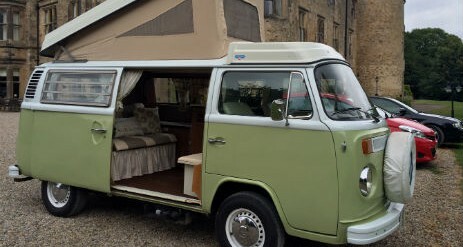 You can of course also hire one of our stunning classic vw camper vans and drive yourself to take in the sights of our beautiful country, especially the North East coast, Yorkshire Dales, The Lakes and the Scottish Borders all within close proximity. We know (from our own experience recently) that organising a wedding is very expensive so we have set our price very competitively. You will also receive a complimentary gift to remember the day. 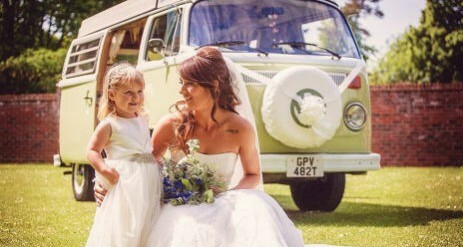 Sweet Campers will be happy to discuss the finer points of providing you with VW wedding transport. We are always up for something a little bit different too (which is why we love VW Campers) so just ask if you have something in mind. We can make your wedding day or special event totally unique and a great surprise for all of your guests. We have a stunning vintage sweet shop set up to serve from of our Vw Campervan, which your guests can visit to collect their sweets. The shop will be attended by a friendly assistant for the duration of your event. 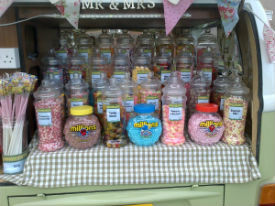 You can have the sweet shop set up either from the back, so you and your guests can explore the campervan too or set up from the side which offers a stunning display. 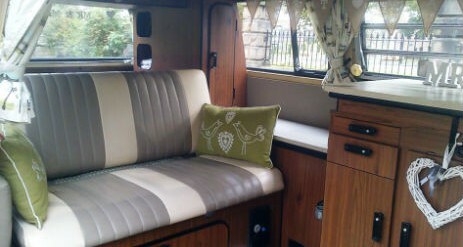 The campervan is tastefully decorated and includes fairly lights if it gets dark.